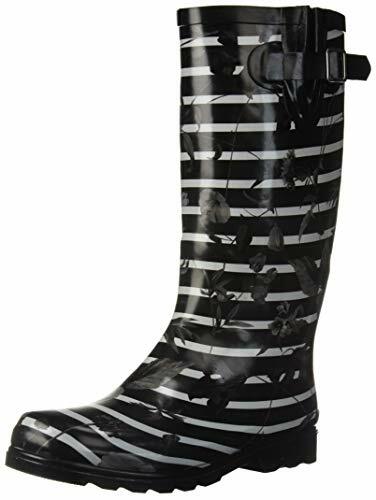 Here you will find vertical and horizontal striped patterns Wellington boots for kids and adults. 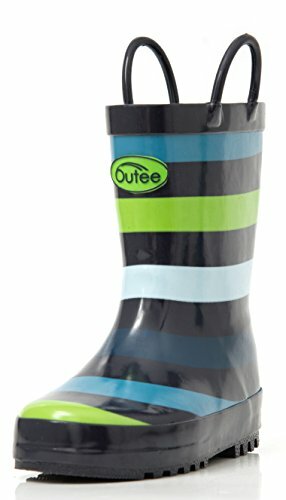 Stripe wellies are colourful and trendy. Look for quality design in natural rubber. Nomad rain boots are intended for general wear, not for sport or utility. Use in heavy snow terrain is not recommended. 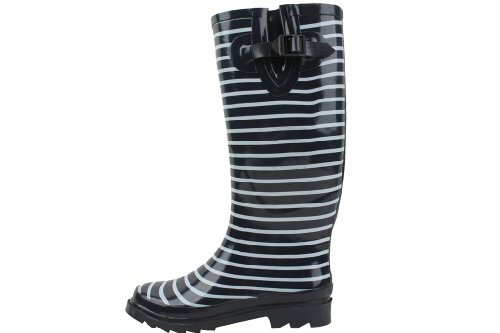 It may be pouring down but keep your spirits high with these bold Vera Bradley® Rain Boots. STYLISH AND FUNCTIONAL | Pick from a variety of prints and solid colors to finish out your wardrobe. The beautiful patterns and colors combined with the functional features promise to keep you coming back for more! WATERPROOF RUBBER UPPER | Our main goal is to combine fashion with function. Our Tall Rain Boots are made with natural rubber, which will provide waterproof ability while enhancing your wear due to the strong, durable abilities of rubber. HANDMADE CONSTRUCTION | Our Tall Rain Boots undergo a handmade waterproof vulcanization process. This construction assists with strength and durability, as the seams are reinforced and weak spots reduced. EASY ON AND OFF | An adjustable strap and pull tab help you get these boots on. This is perfect for the woman on the go! Additionally, they provide a unique accent that will make this boot stand out amongst a large crowd. TRACTION RUBBER OUTSOLE | Nobody likes slipping and falling in wet weather, so we help prevent these slippery issues by making our Tall Rain Boots with a traction rubber outsole that gives some slip-resistance. COZY LINING, INSOLE | We use polyester/cotton blend lining that is soft to the touch and absorbs moisture. To cushion your feet, we use soft removable insoles that promise standing on your feet will no longer be a chore. FIT | Our Tall Rain Boots run a half-size bigger. For half-sizes, we recommend sizing down. EASY CARE | To clean, use a damp warm cloth and mild liquid dish soap. Air dry. Silicone conditioners can be used too. We suggest storing our boots in a cool, dry area to help prevent the boot from damage. MEASUREMENTS | The shaft is approximately 13" from the arch. The boot opening is approximately 15" around. The platform measures an approximate 0.50 inches. Please note that measurements vary. 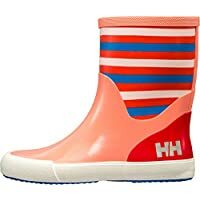 These wellies are available in 6 great designs in the following sizes - UK 4 (Euro 37), UK 5 (Euro 38), UK 6 (Euro 39), UK 7 (Euro 40), UK 8 (Euro 41). They are made from high quality rubber meaning these wellies are comfortable and easy to walk in. They have an adjustable buckle with an extending gusset at the top of each boot to allow for a wider calf. The approximate calf measurements, measured around the inside of the top of the boot with the buckle tightened are as follows - UK 4 - Calf 38cm, UK 5 - Calf 39cm, UK 6 - Calf 40cm, UK 7 - Calf 41cm, UK 8 - Calf 42cm. The overall approximate height of the wellies is 37cm measured from the bottom of the heel to the top of the boot. Each size are the same height. Please select the size and design you would like. Rubber rand with functional heel kick for easy remove. !!!❤!! !The age range is just a reference,look at the specific size behind that,Thank you!!! 0.1in CR flex-foam for comfort.